I’m a nervous spender, so i haven’t actually done much eating out, but i have promised myself a treat every time i have finished a picture. I have however been to two places. 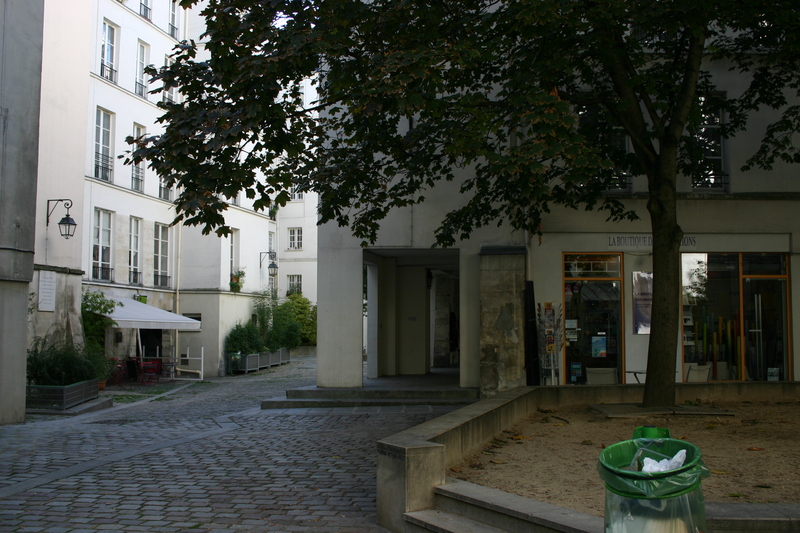 The first one is very close by, called “comme a la maison” and owned by my friend Paul Boulitreaux’s friend Cathy, so this time i could have a hearty chat with the proprietor! Paul she sends her regards. 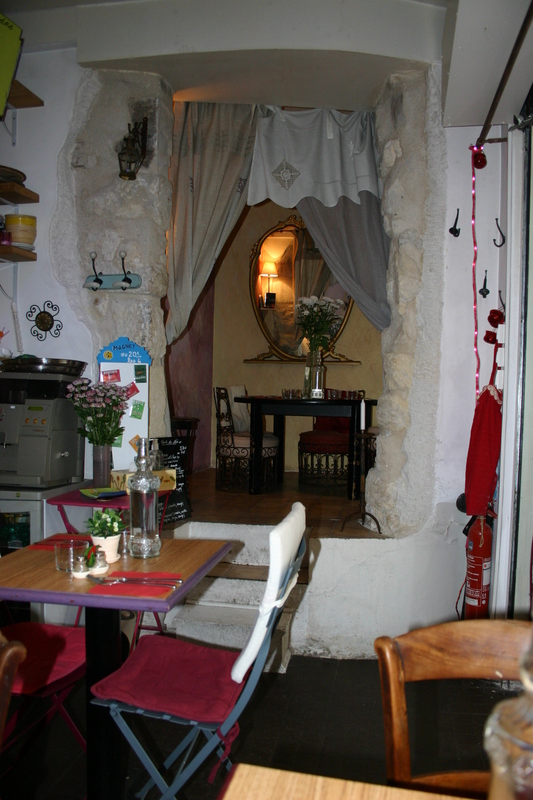 Cathy’s tiny little restaurant is situated in the “Village St. Paul” the combined courtyards of a block of 17th and 18th century houses, so really part of old Paris, as is a large part of the Marais. It is also home to a number of small antique shops and galleries, beautiful. During my first visit to Paris, a friend from Kleinbosh Naomi Smit (now Canard!) took me to the old Paris Mosque for lunch. 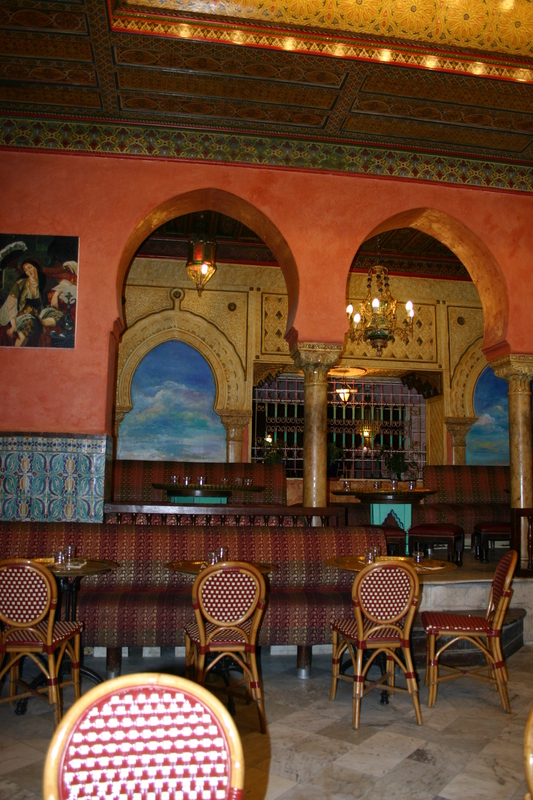 It has become one of my favorite places, not only because of the divine Moroccan/Algerian food, but for the interior, the likes of which i last saw in Turkey. I had a mutton tagine cooked till the meat dropped off the bone, with prunes and almonds in a delicately spiced sauce. Sounds good? IT WAS. Difficult to see on the picture, but, as last time there are a number of little sparrows flying around the interior, they must have nests somewhere, but it certainly lends to the exotic atmosphere. Haai Charlotte. Paris Mosque was een van die plekke op my lys waarby ek nie uitgekom het nie. Die kos klink wondrlik. My kollega wat saam daar was het my een aand na ‘n seekos plek geneem. Dit was interesant om te sien wat die Parysenaars op so bord voorsit. Een van die skulpies het gelyk soos iets wat ons in die Kaap ‘periwinkels’ noem. ‘n Ander seediertjie het kompleet gelyk soos die ‘shrimp’ wat mens by Hermanus se ‘lagoon’ uitpomp. Beide smaak ietwat anders as die Suid-Afrikaanse spesies. ‘n Groot krap was die ‘centre piece’, ‘n maaltyd op sy eie. Mooi bly en lekker werk!